High Plains Samurai is a post-apocalyptic cinematic fantasy role-playing game written by Todd Crapper and published by Broken Ruler Games. 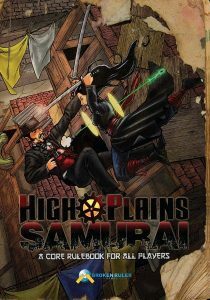 High Plains Samurai is something of a mash-up of genres wrapped around a post-apocalyptic foundation. While you may want to groan, this is not done in an awkward way; it’s done a very purposeful way embedded in the canon of setting. Picture this… you have this space created by this divine being. The divine being creates a bunch of children and the children have a planet that flourishes in many different ways. The divine being goes from a level of chaos to a level of order. But after a while, the divine being doesn’t like the way things are going and gets mad, vowing to tear the planet apart. It partially succeeds, but is stopped by its children and locked away. The problem? This godlike being of chaos has devastated the planet, isolating its major centers of population from each other. Due to isolation, feuding, warlord rule, etc., these major population centers grow in different ways. This creates very distinct regions on the same planet, exhibiting what is effectively different genres (wuxia, gangster, steampunk, dark ages, etc.). These distinct regions exist on this post-apocalyptic backbone and are weaved together by those who, let’s say, what the fringes of society with disregard to the isolation of these regions. They go where they please, do what they can, and can actually work through their differences to come together for a common goal. This is High Plains Samurai. I have deemed this setting as post-apocalyptic fantasy, but with a cinematic twist due to the style of gameplay presented by the mechanical backbone – ScreenPlay. You’ve likely heard it stated many times how role-playing games are stroytelling games (not all, but most of them are). These stories are akin to novelizations and oral traditions. ScreenPlay allows you to tell an interactive story, but its akin to a movie with high cinematic action. It does this by focusing less on the mechanical representations of characters (e.g. skills and attributes) and focuses more on how the players narrate what they’re doing as if they were writing the script of their character. This translates into an escalating die mechanic whereas the more you describe, the higher the die you roll (up to the character’s maximum potential). This breaks free from the standard gaming norms of “just doing” and empowers the player to really think about every action the character performs in order to do what they’re want to do. And then describe it; you can even modify the scene like taking over the camera in a movie and making it more interesting. All of this comes together beautifully in High Plains Samurai. The setting is varied quite a bit, but it’s done in a meaningful way, tied directly to the canon and in the flavor of each potential character type. It fully embraces the high, cinematic action style of ScreenPlay and can make for some very memorable gaming sessions.